I don’t remember the last time I checked out a two-wheeler website in India so I was very excited when I came across the Pulsar Journey to No. 1 site via the Webchutney Newsletter. 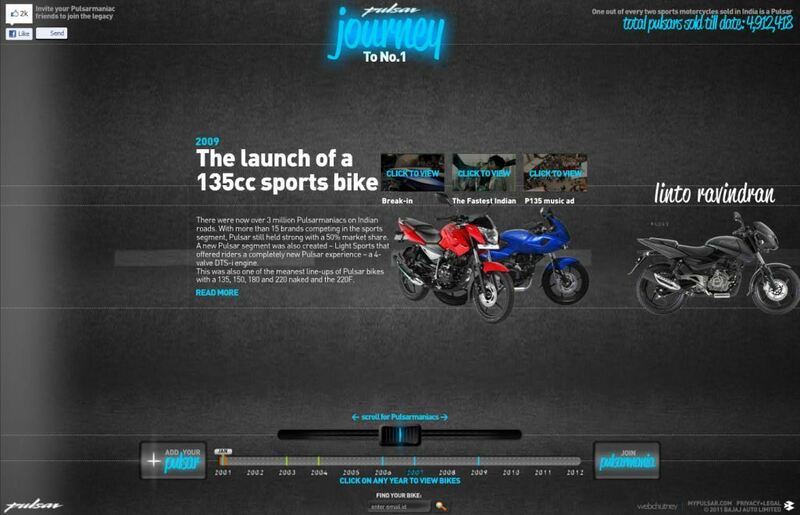 Journey to No.1 is a promo on the My Pulsar site calling all Pulsar owners to mark their presence on the Pulsar legacy. 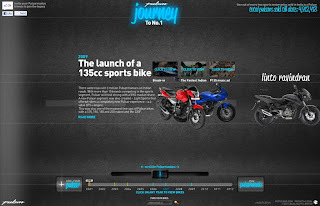 The site showcases a timeline with the history of Bajaj Pulsar and the bikes since 2001 and their stories. There is a Pulsarmaniacs (that’s how they address Pulsar fans ref. Stunt Mania) scroll – which basically showcases stories & images of bikes submitted by Pulsar owners (bit hard to navigate on some browsers/ lower bandwidths). If you are a Pulsar owner and want to be a part of the legend, you can share your bike story and image here too. The Pulsar Mania site basically profiles the MTV Stunt Mania association and related content – videos of the episodes, riding tips and general (site hygiene) downloads. There is also a lot of content around the bikes and technology that drives them etc. The Pulsar License seems to be a popular application and fun too. It generates a visual license with the data you put-in on the site. Is Pulsar doing a campaign online to promote Journey to No.1? I haven’t noticed any branding activity unless it’s yet to begin or it’s a targeted campaign. An execution like this deserves a bit of a splash online so everyone checks it out.